Craft brewing could be the perfect industry for collaborative robots. But, does automation mean losing your artisan status? We find how craft breweries can use robotics to scale-up their business without compromising on quality. Robotics and craft beer don’t sound like they go together, right? Think of craft beer and you think of a lone artisan brewer, stirring a huge pot of boiling malt with a long wooden spoon. Think robotics, on the other hand, and you probably think of a huge factory with automated conveyor belts, rivers of bottles and an army of robot arms. In the past, automation meant mass produced beer — not anymore. Robots are coming to craft brewing. We’ve been thinking a lot about beer here at Robotiq because we recently tried our hand at home brewing. 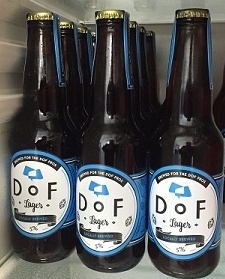 We made a limited edition batch of DoF Lager especially for members of the DoF robotics community. Yeah, we like a challenge at Robotiq — lager is one of the trickiest beer styles to get right. Our brewing experience got us thinking about the craft brewing industry. Craft beers are now popular in many countries. This is great because it means that quality beer is everywhere. However, it’s popularity also causes a big problem for brewers. How can you scale up a craft brewery while staying true to your artisan spirit? The more popular your beer becomes, the more people want to buy it. Sooner or later, all manufacturing businesses hit a bottleneck. For brewers, that bottleneck could, quite literally, be in the neck of a bottle. Earlier this year, I visited a craft brewery where they do everything by hand. It’s a small brewery, but not tiny; they can brew over 1500 litres per day. One thing that struck me, as an engineer, was that they did all their bottle capping with a bench capper (which caps two bottles at a time by pushing down hard on a lever). If this were my brewery, I thought, I’d automate that task. There’s a real danger of musculoskeletal disorders when performing this type of repetitive action hundreds of times a day. Also, the task doesn’t add any value to the beer, it’s just a necessary step in the bottling and packaging process. Surely, a perfect candidate for automation. Craft brewers are often suspicious of any type of automation, which I understand. There’s a worry that using robots will mean that you can no longer call your beer an artisan product; however, automation doesn’t mean you have to make generic beer. In fact, automation can free you up to make even better beer. 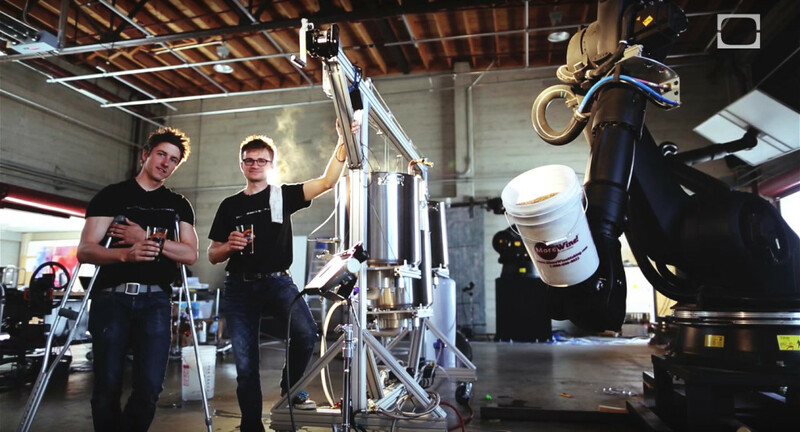 In 2015, Windmer Brothers made a brave choice to add robotics to their craft brewery. They added a KUKA manipulator to help with palletizing, which is also a non-value-added process. Ben makes a good point in this video. If you give the repetitive tasks to a robot, you have more time to focus on other aspects of the brewing process — like coming up with new beer recipes! As we are also starting to see in the artisan bread, farming and coffee industries, robotics is converging with the artisan food and beverage sector. The robot used by Windmer Brothers was big — requiring a lot of space and restricted access — but collaborative robots are much smaller and are designed to work alongside humans. They can fit right alongside your existing equipment. As with any investment, it’s a good idea to consider specific applications before deciding to buy a robot. A good place to start: How to Get Started With Collaborative Robots and the eBook How to Shop for a Robot. Use the worksheet in the learning kit to assess some possible tasks for the robot. 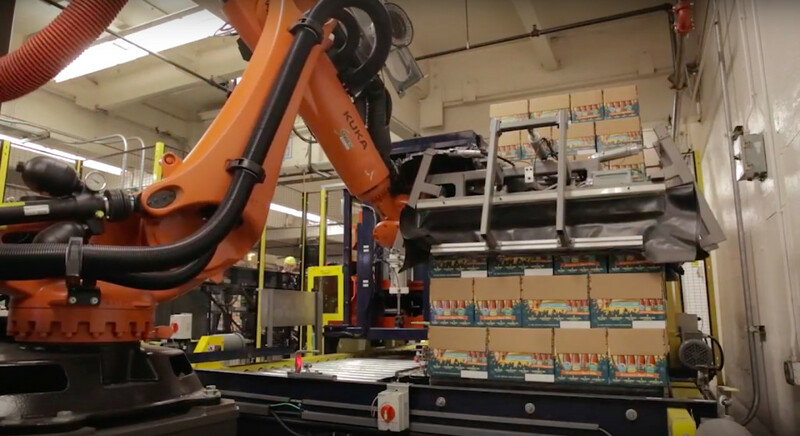 Packaging is a non-value-added process: The beer is already made at this stage so there is no chance of the automation compromising on quality. Packaging has a high risk of musculoskeletal disorders: As anyone who has packed beer knows, it involves a lot of repetitive movements. This might not be risky when your production is low; but the more beer you make, the higher your risk of repetitive strain injury (RSI). Hand packaging produces breakages: Packing bottles into a box is a simple task, but after you have done it over 300 times (and you’re only halfway through the batch) you are much more likely to drop a bottle or two. One big advantage of robots is that they don’t get tired. Packaging usually doesn’t require extra technology: Some of the tasks which you can automate in craft breweries will require extra machines (like automatic labeling machines or semi-automatic bottle cappers). However, packing applications are usually going to be palletizing or simple pick-and-place tasks, which require no extra sensors or equipment. This makes them a great first robot application. In the next article, we will discuss specific applications in a craft brewery which are great for robots. None of these tasks involve touching beer, so your artisan status is safe. However, as the guys from Dirty Robot Brewworks show in this video, you could also use robots in the cooking if you really wanted to.